Layer Webhost Review 2019: Is Layer Webhost a Good Hosting? Layer Webhost is an excellent option for both personal and small business websites with unlimited storage, unlimited bandwidth, and free SSL certificates. Their business plan is a fantastic value with a lifetime free domain name. Also, new customers get to lock in their pricing for life. Layer Webhost has been providing web hosting services since 2013 and has now served thousands of clients around the world. They offer shared hosting, VPS, and dedicated server solutions for both personal and business websites. Their shared hosting product offers excellent basic features and a lifetime free domain for business accounts. It’s rare to find a provider that offers dedicated IP addresses with shared hosting plans, let alone DDoS attack mitigation. With Layer Webhost, you won’t have to worry about many online threats. Plus, you have greater creative freedom to design your website with support for Perl, CGI, PHP, and Ruby on Rails. Layer Webhost offers the Softaculous auto-installer with hundreds of one-click app installs for programs like WordPress and more. Otherwise, you can use FTP and cPanel to upload files to your website. The Personal plan is a solid option and offers excellent value for money for single-domain hosting. For just a bit more each month, you can upgrade to the Professional plan, which is perfect for multiple domain hosting. But by far the best value is their Business plan. It includes both a dedicated IP address and a free domain name for life. In many cases, the yearly registration cost of the domain alone is worth about as much (sometimes more) than the price of this hosting plan, so this option is highly recommended. If you don’t need a dedicated IP address for your business, I recommend going with at least the Professional plan. For the same price as an entry-level shared hosting plan with many other hosts, you get professional level hosting with this host. No, you don’t get a free domain, but you will still save money, especially since all plans come with free SSL certificates. One of the best traits of Layer Webhost is that once you sign up for a plan with them, you will lock in your initial pricing for the entire lifetime of your account. Also, all plans come with a 30-day money back guarantee. Layer Webhost offers solid support with 24/7 telephone, live chat, and ticketing support. They also have a searchable knowledge base, but they don’t provide an obvious link to it. You can search their help database by clicking on the magnifying glass icon at the upper right-hand corner of their website. Whether you’re looking to build a personal website or a webstore, Layer Webhost has a plan for you. Their Professional plan is an excellent value for most websites while Business plans get the added benefit of a free lifetime domain registration. Best of all, you can lock in your rates for life, meaning you always know what you’re paying for web hosting. 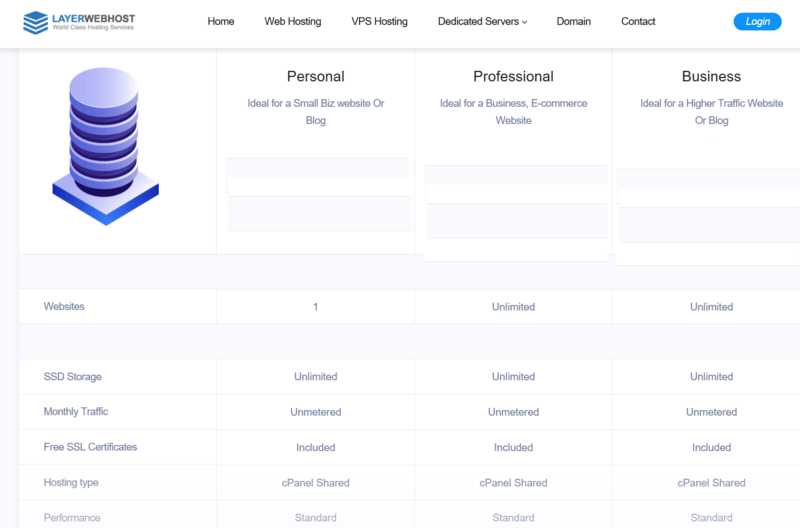 Check out Layer Webhost’s web hosting options today! Wondering how Layer Webhost stacks up against other Web Hosting companies? Enter any other Web Hosting company and we will give you a side-by-side comparison.